Genuine Brother® Accessory. Open toe foot for 5 mm feed dogs on vertical bobbin case machines. 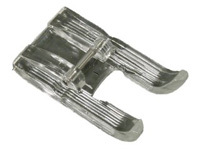 Open Toe foot is used with any application where extra visibility while sewing is desired. Use where visibility is important for seams with markings or curves and pattern markings. Wide opening for wide range of left to right needle positions.